Twitter, the new micro blogging tool has changed the way of communication. The limitation of 140 characters for tweets has made a tremendous change in the style of net discussions. Twitter, with more than 20 million unique visitors currently is considered as one of the fastest growing micro blogging tools. Though Twitter was started in 2006, with a view to encourage discussions within the closed family members and friends, the potentiality of Twitter has now extended to Governments, Corporate houses, individuals, business, etc. Even the Business houses, use the Twitter for their marketing purposes, customer care, etc.Hundreds of Twitter applications have also brought in lot of creativity in this 'tweet' communication. August 09 issue of Corporate ezine PR-e-Sense deals with this concept of Twitter. As part of an article, PodUniversal interviewed telephonically Deep Sherchan, Chief Marketing Officer of InRev. 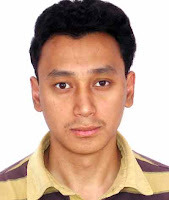 Deep, hailing from Kathmandu, Nepal is one of the social media evangelists and is also part of the team who write a book on Twitter. Please listen to his interview (15 min), by clicking 'play' button in the flash palyer below. The audio streaming will be smooth in broadband connections. If you find any difficulty, you may right click this link and download the mp3 file (15 mb) to your desktop and listen. Please tweet this page through the link given at the top.